Perfect Puppies For Picky People! Meet Trudy! I purchased her specifically to breed to Ch. Hugely but she immediately stole my heart! Her sire is GrCh 'PR' MaldonFox Strike A Nerve and her dam is GrCh 'PR' Fritzfox Waltzing Mathilda. Both parents are excellent show dogs as indicated by thier Grand Champion titles. Trudy matured as a rather small Toy Fox Terrier (5 lbs, 3 oz) but she has lovely bone and that strong underjaw so often missing in this "terrier turned into a toy breed". I like this shot because she's smiling at Denise and you can see that she has a chin! Many toy dogs have a weak muzzle and dental problems. Coming from Working Breeds (Akitas O'BJ) I insist on strong underjaw and good dentition. Trudy was bred to Ch. Hugely who is a Toy Fox Terrier legend. 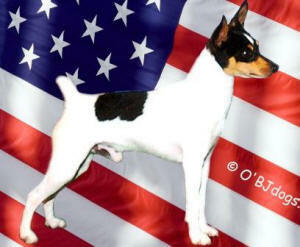 Click here to see Hugely Handsome in his younger days when he was the #1 Top Winning Toy Fox Terrier. He stamps his puppies with extraordinary soundness, strong bone and upstanding structure, vital breed qualities which are increasingly diminished in the show rings. The TFT must be preserved as a perfect balance of toy dog size and intelligence with terrier structure, vigor, and hardiness. Trudy's litter was born February 5th, four breech deliveries, only one puppy survived and I nearly lost Trudy. The surviving female is not for sale. Fingers crossed she did not inherit the breech birth gene and will mature larger than her mother. Trudy will go to a lucky owner to be spayed. I love her dearly but can not risk this deadly fault in my bloodline. Now 28 days old, already showing her wonderful personality. If you stumbled over this page, her puppy is not for sale at any price.